Quad-Core processors are all the rage these days, but with the economy down and out people might want to take another look at dual-core processors to keep your household budget intact. AMD is today announcing the Athlon X2 7750 �?a STARS-based (Phenom 65nm core) processor that is a brand new dual-core processor based on the Kuma core. Since this processor is based off the Phenom core it has L3 cache, this should make it competitive in terms of both price and performance to the $82.99 Intel E5200 dual-core processor. The AMD Athlon X2 7750 is launching today with a $79 price tag when bought in 1000-unit tray quantities, so it is priced directly against the Intel E5200. It has been a long time since we have looked at a dual-core processor on launch day, so lets get right to it. 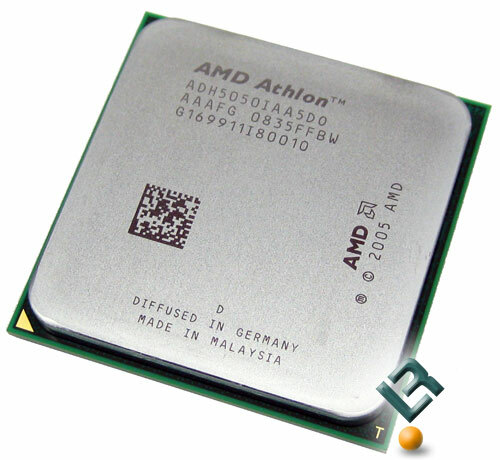 The AMD Athlon X2 7750 is a dual-core processor with a 2.7GHz clock frequency. This is a Black Edition processor, which means that even though it comes set at 200MHz x 13.5, it has an unlocked multiplier that you can change for improved overclocking. The Athlon X2 7750 has 2 x 512MB of L2 Cache and 2MB shared of L3 Cache. This is a huge step up from the older Athlon X2's that had the same amount of L2 Cache, but no L3 Cache. 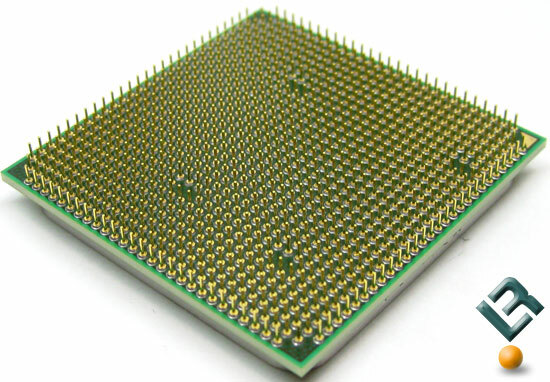 The AMD Athlon X2 7750 uses the same HyperTransport 3.0 bus that Phenom processors use as it is based off the same core. The Athlon X2 7750 has the HT set to run at 1800MHz an will work just fine in any socket AM2+ motherboard. The X2 7750 features a maximum Thermal Design Power (TDP) of 95 Watts, which means that it should be able to work in nearly any motherboard with the proper socket. The picture above shows all 940 pins that are needed for the Athlon X2 7750 processor to operate. To compare the Athlon X2 7750 to something recent on the dual-core front we will be looking at the Athlon X2 5050e as well. 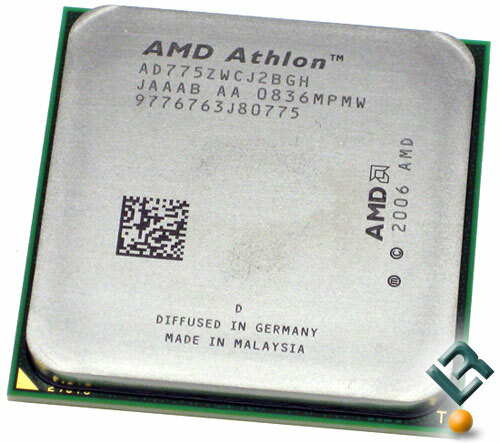 On October 21st, 2008, AMD launched the Athlon 64 X2 5050e processor, which is based on the 65nm Brisbane core. The AMD Athlon 64 X2 5050e processor is clocked at 2.60GHz and has a TDP rating of just 45 Watts at the highest peak power. The Athlon X2 5050e is wildly popular for Small Form Factor (SFF) and Home Theater Personal Computers (HTPCs) as the low TDP means that it puts out less heat and consumes less power than other processors in its class. At $61 when bought in 1000-unit tray quantities, it costs 23 less than the Athlon X2 7750, but has less cache, a 100MHz lower core clock and an older and slower HyperTransport. It is interesting to point out that the 5050e and 7750 that we are testing here today were made just one week apart and yet the 5050e came out two months ago.